I create my winter knits out of a variety of fibers. Some are acrylic or acrylic blends that can be machine washed and dried. Others are 100% wool, for improved warmth and that wonderful, traditional feel. 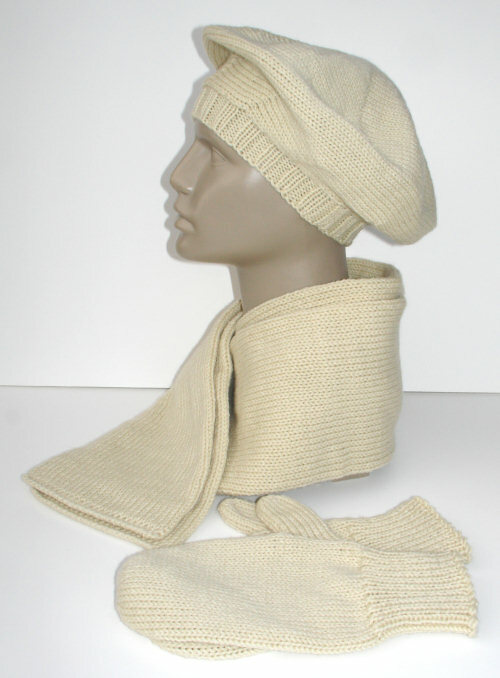 Winter knit sets are wonderful gifts for friends and family. Easy to fit, and useful, you can request the color(s) and fiber of your choice. Regular winter knits are classic designs that I use over and over again. They may be in stock in some colors and sizes. If you prefer something more unique, scroll down to see ideas for custom winter knits. Please also look to see what customers say about my winter knits. Regular winter knits may be in stock in some colors, fibers, and sizes. If I don't have exactly what you want, I can usually knit it without delay, since the patterns are my standards. See how to order Winter Knits. For more information, please visit the Knitted Headbands page. 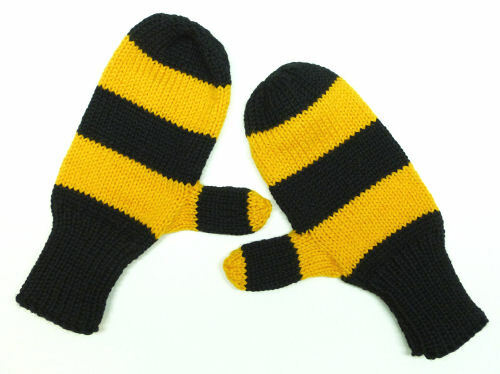 For more information, please visit the Knitted Mittens page. 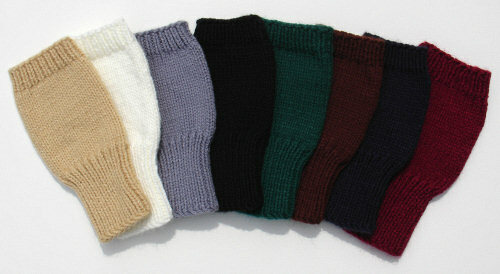 For more information, please visit the Knitted Fingerless Mittens page. 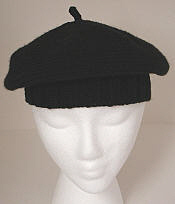 For more information, please visit the Knit Beret page. For more information, please visit the Knit Beanie Hat page. For more information, please visit the Knitted Scarf page. Some of the custom winter knits pictured below are one-of-a-kind creations. Others can be reproduced on request. These photos represent just a few possibilities for your special winter knit item. Please visit my Winter Knits Gallery for more ideas. 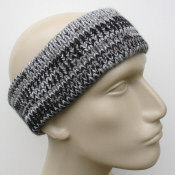 If you see something you really like, find out how to order Custom Winter Knits. The Ready-made Handmade page also includes some one-of-a-kind items that are still available. 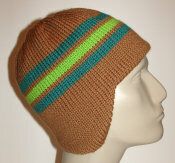 This is an incredibly cozy hat, knitted for someone who works at a tree nursery and is outdoors in all weather. 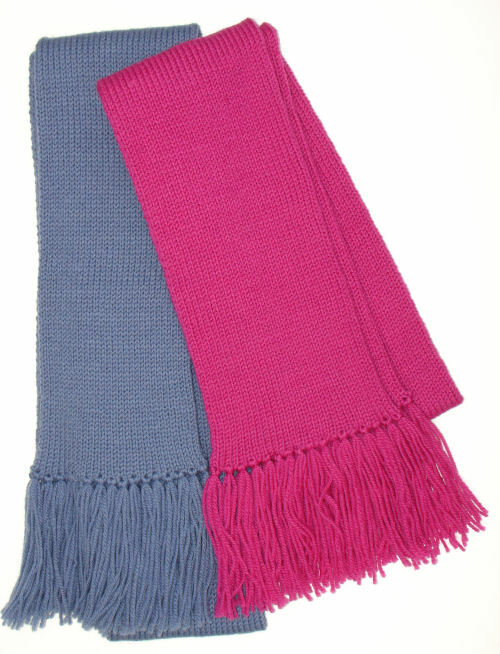 The outer layer is wool for warmth, while the inner layer is acrylic to avoid any risk of itchiness. 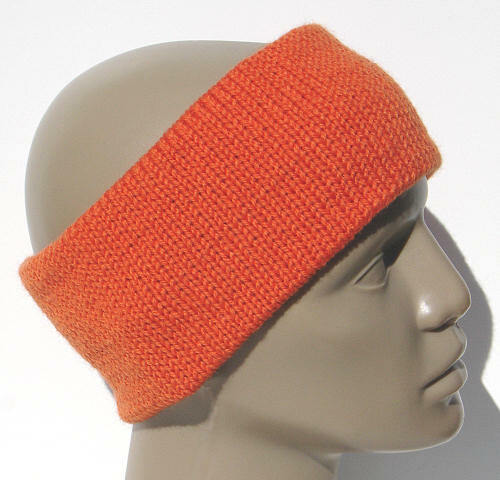 Like the helmet to the left, this headband is wool on the outer layer and acrylic on the inside. The earflaps insure that there's enough coverage for wintry weather. 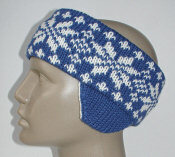 I also knitted a red snowflake headband, which can be seen in the Winter Knits Gallery. The mottled appearance of this headband was achieved by knitting with 3 strands of thin yarn held together: 1 black, 1 dark gray, and 1 light gray.